Dr. Janet Coller, Lecturer at the University of Adelaide, has an established track record in Pharmacology and Pharmacogenetic medical research within the health areas of cancer, drug dependence, cardiology and solid-organ transplantation. 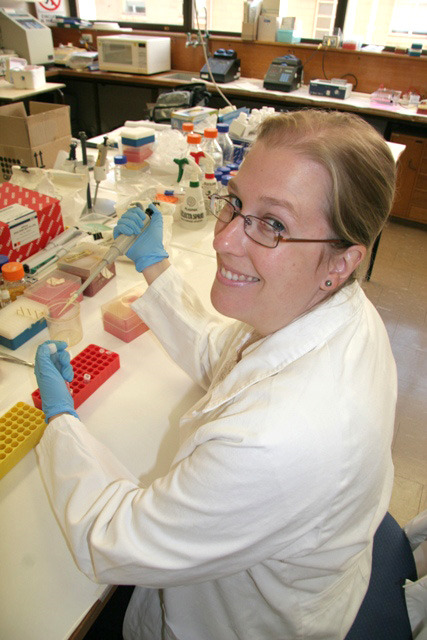 Her research includes work to identify how genetic variability impacts the therapeutic use of tamoxifen for breast cancer, identifying important genetic variants that determine successful treatment of opioid dependence with methadone, and research in the emerging field of immunogenetics. Impact of genetic variability in immune signalling on the incidence and severity of chemotherapy-induced gastrointestinal mucositis: to determine the impact of genetic variability in immune signalling pathways on the incidence and severity of gastrointestinal mucositis following chemotherapy. Pharmacogenetics of addiction: to determine if differences in the genetic variability of the complex network of genes involved in the regulation of pro-inflammatory cytokines and immune signalling pathways may be associated with the development of dependence. She recognized that recruiting participants is often a challenge for clinical research and wanted to ensure that she made it as easy as possible to attract participants to her studies. For each of her studies, the goal is to collect a minimum of 100 samples. In addition, Dr. Coller did not want to be restricted to research subjects that were close to Adelaide and hoped to attract a broad range of participants from a wide geography, even spreading to international cities. For this reason, she designed mailing studies that would allow people to receive a DNA collection device in the mail, self-collect the sample at home, and return the collected sample to the university by mail. Samples had to be stable at room temperature for up to 3 years, when they would be analyzed. Multiple isolations of DNA from each sample were required. The quality and quantity of DNA from the samples had to be very high. The collection method had to be extremely cost-effective. Dr. Coller quickly realized that blood-based DNA would not be a good option for her projects but felt confident that she could find a saliva-based solution to meet all her criteria. She evaluated buccal swabs as a possible option but found that this method was unable to meet her requirement for both high quality and quantity of DNA. She quickly settled on the Oragene saliva-based collection method. Oragene is ideally suited for mail-based collection as the DNA can be self-collected in the home and mailed through the standard postal system. Dr. Coller also found it to be a more reliable method of obtaining large amounts of DNA in a single sample, allowing for multiple isolations. While Oragene met all her criteria, the main benefit was the ability for participants to provide the DNA sample in the home and mail it back to the research center, facilitating her requirement for a mail-based study. Both the quantity and quality of DNA have been excellent in 99% of the samples collected to date and it has been a very cost-effective solution for her as well. Overall, Oragene’s saliva-based collection method has been very successful and its use is spreading. After seeing Dr. Coller’s use of Oragene kits, several of her colleagues have also switched to this method. The clinical research studies are expected to be completed in the next 1-3 years, depending on the study and we look forward to seeing the results of this research in the near future.